If you have any questions, please check out our application FAQs here. Early this week, the Cleantech Open held its annual Global Forum, including an alumni showcase expo, a lively series of startup pitch sessions, a curated speed dating match-up with interested investors, a speaker series, and two competitions—one with finalists and winners of the U.S. Grand Prize and another for the Global Ideas Award. Over 300 people attended the event, with more than 65 companies exhibiting their clean technologies. The U.S. Grand Prize was awarded to Radical Plastics for their development of a proprietary catalyst technology that renders conventional plastics completely biodegradable in the natural environment. The U.S. National Runner-Up was South 8 Technologies for their development of next-generation lithium batteries with proprietary Liquefied Gas Electrolytes. The Global Ideas Award went to Germany’s Nuventura for their development of switchgear that empowers smart grids and eliminates the need for SF6, the world’s most harmful greenhouse gas. The CTO Global Runner-Up was EVA for its development of compact electric and autonomous vertical take-off and landing technology for air taxi services, rescue, and logistics. The event started on Sunday, January 27, at the Los Angeles Cleantech Incubator’s (LACI) La Kretz Innovation Campus, a fully renovated 60,000-square foot building in the heart of the dynamic Los Angeles Arts District, where Finalists and judges congregated to pitch, deliberate, and finally select the six national finalists. On Monday, the public portion of the event opened with the six finalists Live Pitching in LACI’s mini-amphitheater. As the judges deliberated, the global and national startups were offered a series of workshops to support them in evaluating their technologies, honing their business plans, ensuring their market readiness and networking with potential partners, advisors and customers. In addition, startups and participants were offered tours of various leading facilities around SoCal related to cleantech, including Homeboy Recycling, SoCal Edison’s Energy Education Center, and the marine laboratory AltaSea. On Tuesday the main public day of CTO's annual Global Forum, started with CTO, LACI and Global Ideas companies exhibiting at the Innovation Showcase. During lunch, the Global Companies pitched their startup ideas in front of a live audience, followed by a keynote, panel discussion and awards. California Energy Commission Executive Director Drew Bohan talked about the state’s policies to further the work of clean energy entrepreneurs. Ira Ehrenpreis, DBL Partners Venture Capitalist, shared a scintillating conversation with Mapbox ‏VP of Strategic Development Marc Prioleau about the power of mapping for a myriad of cleantech applications. Ramsay Huntley, VP of Cleantech Innovation Philanthropy at Wells Fargo, described the company’s commitment of $200B in financing to sustainable businesses by 2030. The always inspiring Shana Rappaport, GreenBiz’s VP & ED of VERGE conference and expo, pulled our collective efforts together under the descriptive umbrella of the “Circular Economy,” one that seeks to rebuild capital, whether this is financial, manufactured, human, social or natural. We particularly want to thank Wells Fargo and FedEx for their generous support as national sponsors, as well as the hundreds of pro-bono professionals who participated as mentors, judges, and staff. to the program. The multifaceted event was a success for all. Cleantech Open congratulates all the accelerator graduates and cannot wait to see what you all do next! We will be watching, cheering, and tweeting! The Cleantech Open (CTO) startup accelerator finds, funds, and fosters entrepreneurs with ideas to solve the world’s greatest environmental, energy and sustainability challenges. Now, in our 14th year, Cleantech Open is the longest-standing andlargest cleantech startup accelerator in the United States and–arguably–the world. 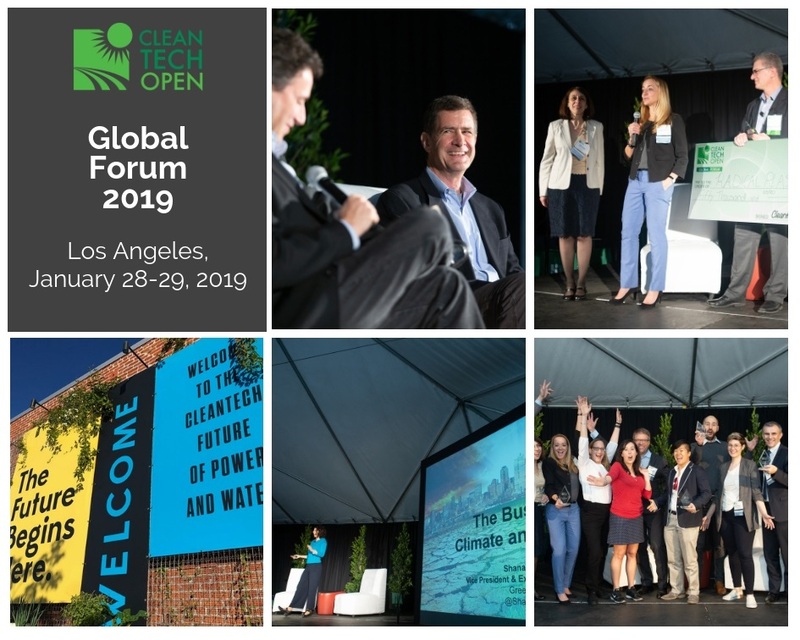 Cleantech Open is headquartered at LACI, the Los Angeles Cleantech Incubator and is a program of Community Partners, a large 501(c)3 non-profit organization. We find, fund and foster the most promising cleantech startups on the planet.